Aromatherapy is the use of aromatic plant oils, including essential oils, for psychological and physical wellbeing. Aromatherapists blend therapeutic essential oils especially for each person and suggest methods of use such as topical application, massage, inhalation or water immersion to stimulate the desired responses. The different smells (aromas), and the chemical constituents of the oils, can produce different emotional and physiological reactions. 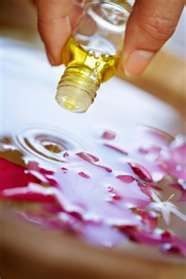 Essential oils can be massaged into the skin, added to bath water or vaporised in an oil burner. Although aromatherapy has been practised for centuries in various cultures, the modern version was developed mainly in France. Below are some benefits and uses for ailments that our aromatherapy rocks provide or is associated with religious practices or ancient beliefs. Cinnamon - is known for it's anti-septic, anti-microbial and parasiticidal properties making it good for head lice, scabies and other skin infections. It relieves mental fatigue, improves concentration, nervous exhaustion and lifts depression. Eucalyptus - is used for burns, blisters, cuts, herpes, insect bites, skin infections, wound care, muscular aches and pains, poor circulation, rheumatoid arthritis, asthma, bronchitis, coughs, sinusitis, throat infections, female urinary tract infections, colds, flu nervous tension headaches or neuralgia. Purifies rooms, allowing cold and flu suffers to sleep. Because it is a detoxifying oil and can alleviate the symptoms of arthritis, it may also help clear the airways for asthmatics. It is a powerful decongestant and is used for chest infections. It has an immunity stimulating property, is an effective local pain killer, especially for nerve pain. It is an excellent repellant, stimulates a sluggish digestive system and helps to eleviate flatulence and muscle spasms. Good for respiratory problems and is a circulatory stimulant. Frankincense - dates back to the biblical era and the birth of Jesus when it was rendered as a gift by one of the three wise men. It is used to treat stress, depression, and sadness. It is used also to help immune system recovery. This oil creates a warm and soothing atmosphere - which is another reason it is often used during the Christmas holiday season. Ginger - is a tangy rich oil, often used as a massage oil for rheumatic pains. Can be combined with Rosemary oil for added relief. A stimulating general tonic, good for all digestive problems and for loss of appetite. Used as a bath oil to ward off colds. May be used for skin blemishes, dry and/or aging skin - care, scarring, wrinkles, asthma, bronchitis, coughs, laryngitis, dysmenorrheal (painful or difficult menstrual cycles), colds and flu anxiety, nervous tension, and stress related conditions. Honeysuckle - is associated with good health, luck, prosperity, weight loss, and physic energy. Jasmine - affects the emotions. It is uplifting and encouraging, produces optimism, and self confidence. Jasmine has a reputation as an aphrodisiac, benefiting impotence in men and frigidity in women. It relaxes the body and has an anti-depressive effect. helps to clear post partpartum depression. It relieves stress and is uplifting during times of lethargy. Lavender - Lavender is considered the mother of all essential oils; it may be used for abscesses, acne, allergies, athlete's foot, boils, bruises, burns, dandruff, dermatitis, eczema, skin inflammations, insect bites or stings, psoriasis, sunburns and general wound care, lumbago, muscular aches and pains, rheumatism, muscular sprains, asthma, bronchitis, laryngitis, throat infections, abdominal cramping, colic, gas, nausea, dysmenorrheal, flu, depression, headaches, insomnia, migraines, nervous tension, stress-related conditions, shock, vertigo and premenstrual syndrome. This oil helps to ease anxiety and stress and depression. Lemon - is used as a cleanser for oily skin. It may be used for acne, anemia, boils, corns, cuts, oily skin, herpes, insect bites, mouth ulcers, varicose veins, warts, arthritis, nosebleeds, poor circulation, rheumatism, asthma, throat infections, bronchitis, indigestion, and colds and flu. This oil can be used to repel insects. It helps reduce high blood pressure and stimulates blood circulation. It aids in combating airborne infections rooms, sharpens the mind, and assists in dispelling confusion. Most citrus scents are good odor eliminators, but weaken fast. Lemon acts as an astringent for oily skin, acne and cold sores is said to help prevent wrinkles because of its anti-aging properties. It has decongestant properties, which makes it beneficial for colds and infections of the throat and chest. Lemon Grass - Encourages desire to embrace, express sensitivity and spirituality - its warmth offers comfort. Sedative properties - effective remedy for insomnia, diarrhea and palpitations. Myrrh - Myrrh is an excellent decongestant and a lung tonic that is good for coughs, cold, bronchitis, and flu. It stimulates, tones and soothes the digestive system. It provides an invigorating scent when used as a bath oil. Orange - is a delicious sweet scent with a high Vitamin C content - good at the onset of a cold, blended with any of the spice oils. Especially recommended for children and states of general debility. Patchouli - A musky, sweet, sensual oil - renowned as an aphrodisiac. A powerful stimulant on the nerves, lifts anxiety and depression. An excellent fixative in massage oils. In skin care it promotes formation of scar tissue and is good for treating mature skin, dryness and inflammation. Too much patchouli will have the opposite effect and act as a sedative. Pine - A pungent, clean scent, good for mental fatigue. Powerful antiseptic for all infections of the respiratory tract when used in inhalation. In the bath, it helps relieve aches and pains. Good for treating rheumatism and gout. Rosemary - A strengthening, invigorating oil, good for stimulating weak memory, also for vertigo and general dullness. Invigorates the circulation. Use in massage oil for aches and pains, and liver complaints. Good as a hair rinse - add three drops to rinsing water. For treating dandruff, apply to the scalp, a few drops in a vegetable oil base. Vanilla - Vanilla has a warm, soothing, and aphrodisiac qualities.- It is used to quell a turbulent mind and open the mind up to creative thoughts.